Explore the magical world of motifs with Kristin Omdahl. 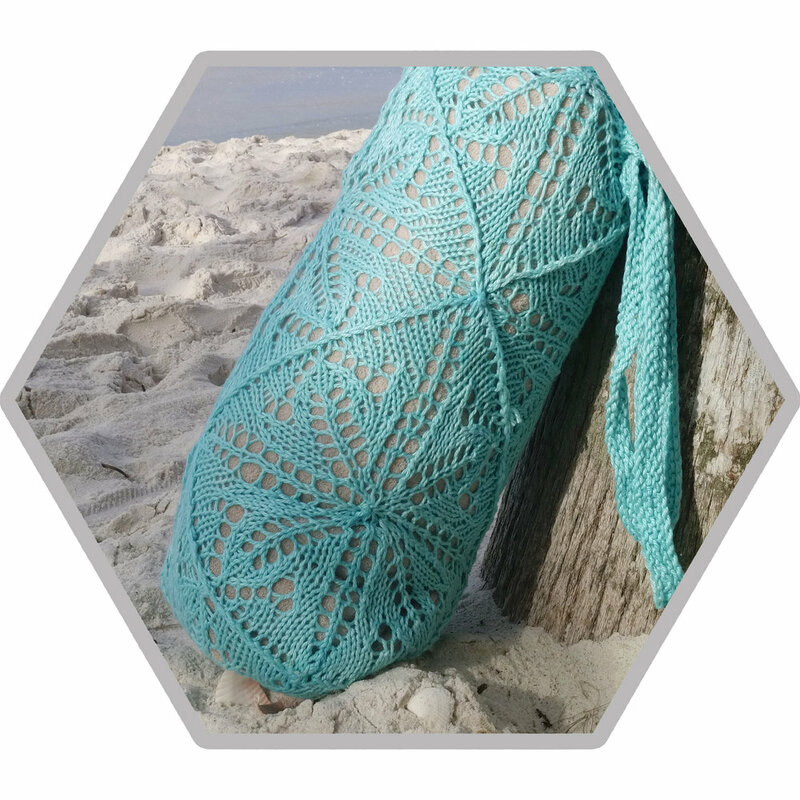 Choose from 17 gorgeous shawls, cowls and bags. Learn a variety of construction styles with charts, line by line instructions, and a massive library of stitch videos & more. Below are links to the entire knitting and crochet stitch libraries on Kristin Omdahl's YouTube Channel, or you can watch them all along side the stitch definitions on the How to Crochet and How To Knit pages. Who says reusable can’t be gorgeous? 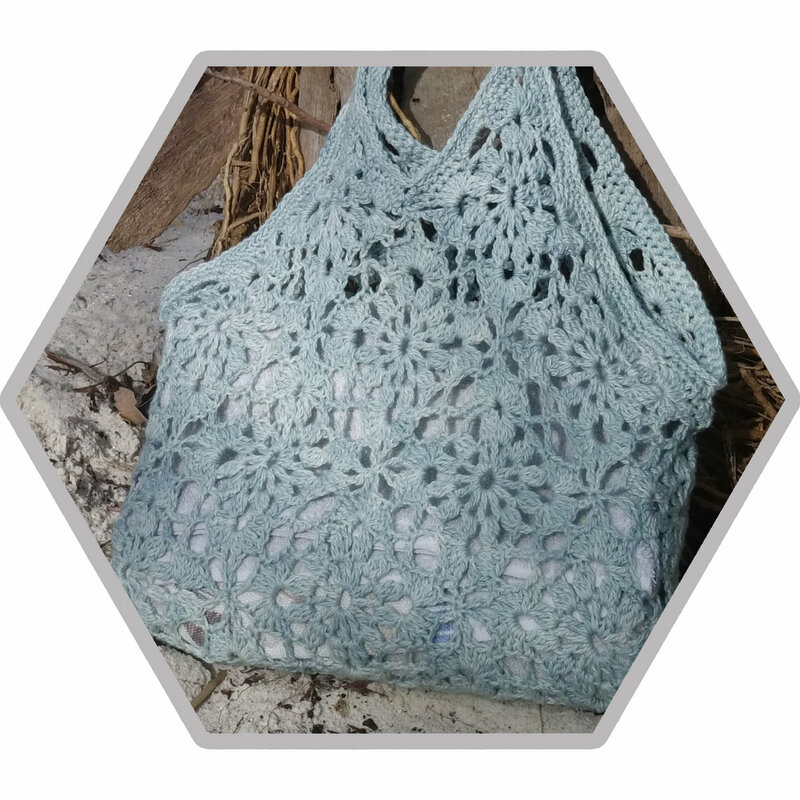 This bag is not only useful and environmentally friendly, but it will also give you the chance to show off some mad knitting lace skills! The seams are purposefully on the wrong side, to give a raised, piped edging to each motif to further demonstrate your knitting abilities! The pattern is a square of four pretty tulip designs. Joined on the diagonal, it gives the bag it’s distinctive look. Use the bag to go to the market or the beach, or stow your yoga mat and water bottle for a trip to the gym; this bag will carry it all - with style! This is a spectacularly fun and festive use of colorwork and lace in a crochet shawl. In one color, you can make this gorgeous shawl with one ball of Be So Fine Yarn, or use a TRIO of TIDBITS to make it in three colors for extra fun! 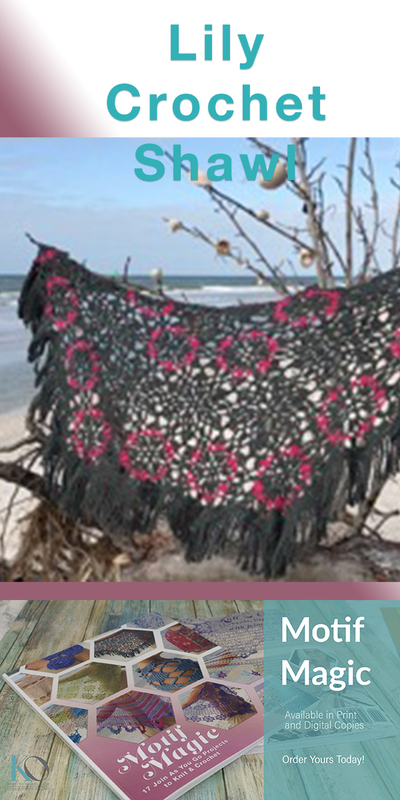 This top down construction shawl moves quickly with X-stitches and the shawl is fringed with the beautiful star-shaped, three round motifs that are joined as you go. Each of these circular motifs begins in the center and binds off with a deceptively simple, crochet-inspired chain edging. 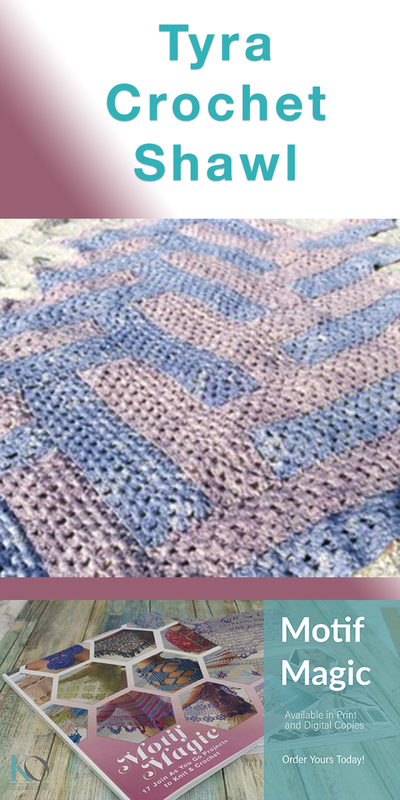 As you knit each motif, you join it to the previous motifs to form strips and a fabric. 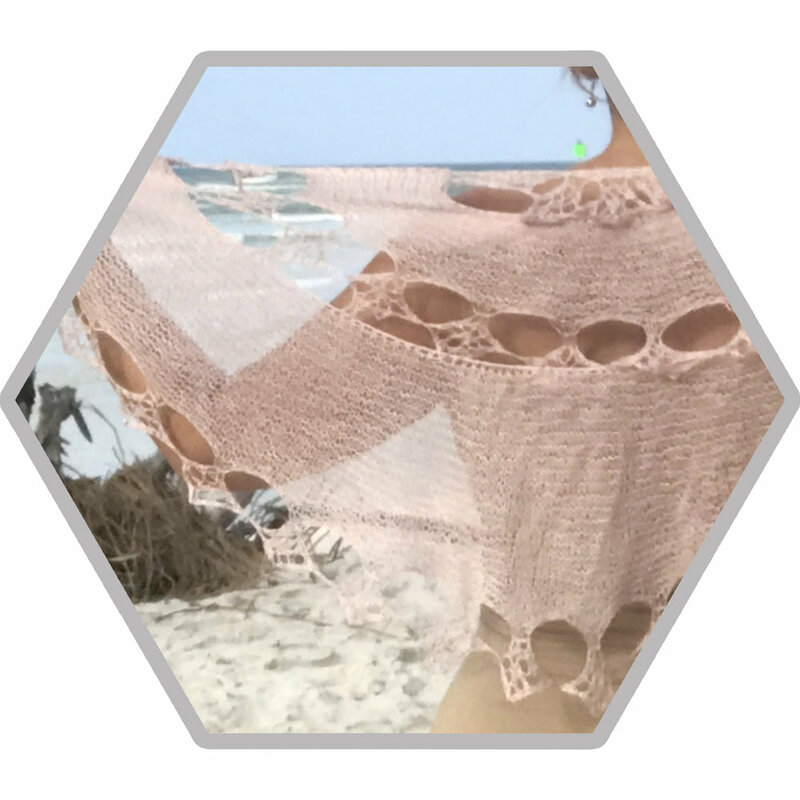 Follow the schematic to create a beautiful triangular shawl. Or, create any number of projects by joining motifs into other shapes like squares (baby blanket) or rectangles (wraps or afghans). Geometry and spatial math is often my underlying design inspiration. For this beautiful shawl, I thought the contrast of pulling out a stitch pattern from the motif to create bands of lace between rows of motifs would be a fun mathematical challenge, and to up the ante further, apply this to a triangular shaped shawl for increasing in the bands and specific joining of the motifs. The graphic contrast of the two components is striking and yet still subtle since the V-stitches are used throughout. This is a generously sized shawl and can be styled in a number of ways. Featuring the motifs along the lower edge adds to the romantic drama. A dramatic and romantic alternative to a scarf, this neck warmer adds texture and bling and frames the face with enthusiasm. This could brighten the darkest of winter days! Each motif is worked individually; the 3-dimensional flower petals are worked onto the surface of each motif simultaneously, and all of the motifs are joined as you go. The crystal gem buttons are added at the end for the extra pop! Large circular motifs are so graphically dramatic yet can produce large gaping holes. Centering mini motifs between the larger ones adds a depth and mysterious illusion to the stitch pattern. Adding the same mini motifs along the exterior with a simple modification serves as a simple, scalloped self-edging. You never know where you will find inspiration; fascinated by the action of the spider weaving its web, working one section while joining to a previous section, my mind burst with ideas for this mobius. It wasn’t until I was finished with the joining of 3 strips that I realized it also resembles an argyle pattern. The effect looks far more elaborate than the actual knitting construction. It would make a stunning throw, scarf or wrap. In this project, you will learn how to twist the strips to create a mysteriously beautiful mobius loop. A beautiful crochet lace motif is gorgeous singularly on its own. Joined into a fabric, the pattern often explodes into a kaleidoscope where the corners meet. In a solid color, it is simply stunning. Sometimes a pattern begs for multiple colors to show even more intricacies in the pattern. And with this beauty, we even deconstructed the motif to incorporate all the beautiful patterning into a matching edging. This mobius is an effortless accessory to drape over your shoulders or gather around your neck. I have always been drawn to creating flowers and natural textures in knitting. This beautiful 6-petaled flower motif is worked in the round from the center out in a solid stitch with the outlying rounds in an open stitch to create the negative space for the flowers to really pop in the center of each motif. The shawl is edged with a ruffle that mimics the open stitch in the motif. Depending on your skill level, there are two options for joining the motifs as you go. Inspiration began with a song for this project. Then it meandered into a visual of a dark and late night marquee with a bright pink neon flashing sign. Every other row of the gray motifs have one round of pink for a flashing bolt of color. The fringe is elevated with a clever technique that twists the yarn into beautiful dangles without cutting! It takes the boho chic look to a whole new sophisticated level. Joining motifs in a diamond formation adds visual interest and allows you to create shapes and dimensions you wouldn't normally have when joining them in square formation. For example, the bottom of this bag is flat because of the placement of two motifs in the center. Plus, the 4 motifs along top edge add greater depth and stability to the handles because of their pointed corners facing up. The construction of this bag is so fun, and can easily be modified to create a wider or taller bag. This is a great sized tote bag for everyday use, with ample space for toting along your craft projects, too. Or it would make a super stylish, eco-friendly market bag! 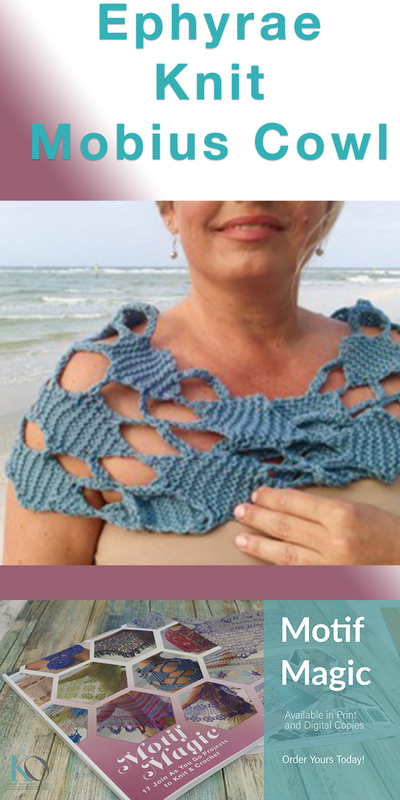 This flirty wrap features an unusual construction method: the “edging” is actually knit first. Fifteen picot-edged half-circles are knit separately in garter stitch, then stitches are picked up to join them and begin the garter stitch base of the shawl. 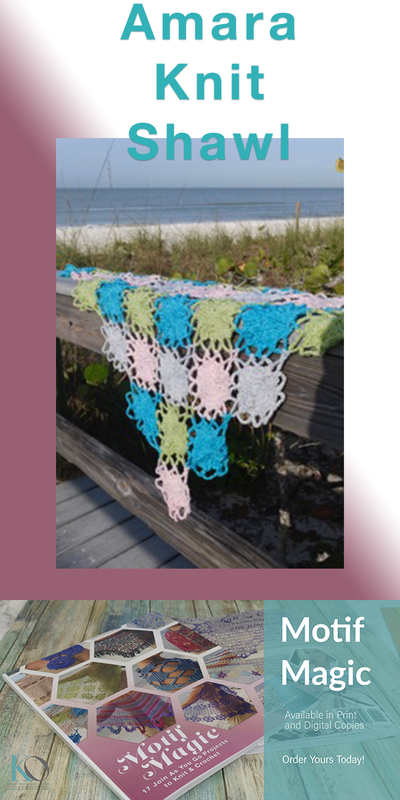 This is a spectacularly fun and festive use of color work and lace in a knit shawl. In one color, you can make this gorgeous shawl with one ball of Be So Fine Yarn, or use a TRIO of TIDBITS to make it in three colors for extra fun! This bottom up construction half-circle shawl moves quickly with easy lace and the shawl is fringed with beautiful crescent motifs. The high contrast of the two colors in this celestial felted bag is really amplified with felted fair isle motifs. The colors are switched on every other motif. This is a great size to learn the techniques. It could easily be modified into a large tote bag or weekender. In this project, you make the four motifs first. You can either join them as you go, or sew them together at the end. The motifs are joined to each other on the sides as you go, and the base and the top are picked up from the motifs for a seamless project, but you can sew them on at the end if you prefer. The larger starfish motifs are joined to each other as you go, and are stabilized with smaller spiral motifs that also join as you go. This beautiful, rectangular wrap’s magical patterning leaves the novice eye wondering where one motif ends and the other begins. Inspired by vintage herringbone tile design, this wrap transforms a simple rectangular motif into a graphically elaborate design with 2 colors of motifs joined at 90 degree angles. This delicate shawl’s deceptively simple construction allows you to utilize beautiful mini medallion motifs and join them as you go without cutting yarn! The motifs are worked in one direction, and the bands of the shawl are joined perpendicularly to the strips of motifs. This is a bottom up construction shawl, decreasing in size as you go. The final 5 mini medallions at the top look like a flower petal after joining. Kristin Omdahl is committed to helping survivors of domestic violence and shedding light on this frightening and often hidden crime in our society. In an attempt to achieve these goals and help eradicate domestic violence, Kristin will donate a portion of the proceeds from this book and all Kristin Omdahl products to the fund she established: Project Kristin Cares. All funds collected by Project Kristin Cares will be donated to help survivors of domestic violence.